I've got the transmission for the Z22E engine that came out of the 1982 200sx mated to my LZ22 motor. The transmission originally went with this engine block, since the block was originally part of the Z22E. However, after turning the engine into the hybrid motor that I've got today, and finally getting around to putting the correct motor mounts on the block (causing my engine to tilt the way it is supposed to tilt in bay: to the passenger side, like a normal L-series engine), the bell housing on my transmission is causing the transmission to tilt over. A common solution to this is to simply bend the shifter arm over to compensate for the tilt... and if I can't find a proper L-series transmission to swap in, I may just do that. But I don't really want to. Hi, I don't have a transmission to trade, but was wondering if you would be willing to answer some questions. I've got a '72 521 pickup with an L20 and a 4 speed in it. 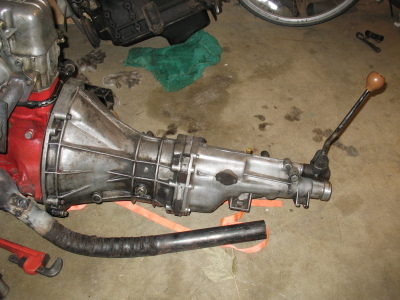 I was under the impression that I could use a 5 speed from a Z without doing any more than adapting the driveshaft. Reading your post, it seems like there is something about the tilt to the engine that makes this not work? Anyhow, if you have the time, I would appreciate whatever info you have on this. Nissan/Datsun did something silly with their naming scheme that causes some confusion. As it turns out, the Z-series (or NAPS-Z) engines (which I'm talking about) have nothing to do with the Z-cars (which you're talking about). The Z-cars use the L-series 6-cylinder engines, and the associated transmissions swap just fine between various L-series engines. The NAPS-Z engines were Nissan's anti-pollution engines (Nissan Anti Pollution System), and only came in the 4-spark-plug 4-cylinder, and the 8-spark-plug 4-cylinder. They were never in a Z-car. The NAPS-Z engines were in a few of the Nissan trucks, and also in the 1980-1982 200sx. They were basically L-series blocks with a cross-flow emissions-controlling head on them. They also had their intake/exhaust on opposite sides, instead of on the same side like the L-series heads. As proof that the L- and Z-series engine blocks are basically the same, a lot of Datsun folks take the L-series heads and stick them onto the Z-series blocks (which is what I've done). The problem with the NAPS-Z engine/transmission combination, however, is that the L-series engines were designed to tilt slightly to the passenger side, whereas the Z-series engines all tilt slightly to the driver side. The bell-housings on the Z-series transmissions are set up to match the Z-engine tilt, so when you stick one onto an L-series engine, you end up with nearly a 20-degree tilt on the transmission, and the shifter arm in the car ends up way out of place. Some folks just bend the shifter arm to compensate for the twist, but that seems like a pretty goofy way to address a tilted transmission. However, if I can't get my hands on a good L-series 5-speed, that may be what I'll do. Regarding *your* situation, be aware that there are two main types of L-series transmissions (which is what you're looking for). There's the "short tail" transmission and the "long tail" transmission. I *think* the 521 has a short-tail transmission, but you'll want to actually measure it. Anyhow, I hope this information is useful for folks hunting for a Datsun transmission. Thanks, man. My LZ hybrid engine is the first engine I've ever built, and I've been enjoying it quite a bit. I don't know what I'd do with four of them, though!